NWCI offers one of the largest selections of table top displays on the internet! We offer a range of products so you can choose the best display for your company. Our table top pop up displays are the most popular options for table top exhibiting because of their professional look, low price point, and easy assembly. 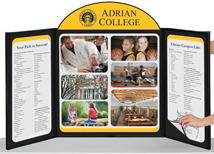 Folding panel table top displays are a great portable option for exhibitors or professionals doing travel presentations. We also carry folding tables and printed table throws. Our line of pop up displays covers all price points so you can have a one stop shopping experience. Why Choose Table Top Displays? We have a large selection of table top pop up displays including economy, premium, and specialty size models. All models are available in a Velcro receptive fabric or full mural printed graphics. 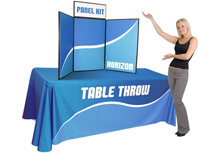 Folding panel systems are a very affordable and portable tabletop display option. We have multiple sizes and styles that are sure to fit any exhibitors need. Full printed graphics are available for every model! Table top banner stands are a great options for exhibitors looking for an exhibit that will work as a table top and a floor standing display. We have multiple sizes and styles to choose from! 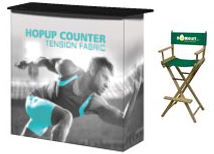 Our fabric tension table top displays will make you stand out at any convention or recruiting event. These displays have a clean and professional look that will set you apart from your competition! Trade show table covers will make your booth look unique and professional. Table throws are ideal for table top displays because they will make your entire booth set up look finished and professional. We offer full dye sub covers that can be printed in any color! We offer many types of portable trade show counters that are stylish and affordable. Stop renting counters at the shows and save money by purchasing your own counter. These counters pack easily into shipping cases and are very easy to assemble! Table top pop up displays are available in multiple sizes to fit any exhibiting requirement. We carry multiple options from many different manufacturers to give you the largest selection of products. We offer economy and premium displays for table tops to give you multiple price points and quality levels. Our premium table top pop up displays come with a lifetime warranty to protect you against any manufacturing defects. We only sell table top displays from top US manufacturers that have quick turnaround and great customer service. We also offer a variety of table top panel systems and unique fabric tension displays. 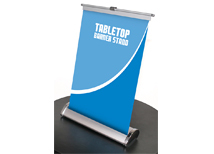 We have table top banner stands that work for table top applications and convert into full size banners. We have seamless panels systems and folding briefcase panels systems that are extremely portable and will fit any company’s budget. We also carry a full line of folding tables and table covers to accent your tabletop display. 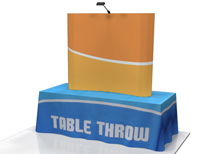 We have standard color table throws that will make your booth look very professional for a low price. We also offer full dye sub table throws that are printed with a full 4 color process so you can print anything on the table cover. This helps to add branding and a professional appearance to your booth space! Table top displays are specifically designed to work on standard 6 and 8 foot tables. Many conferences and events only allow table top displays so this product line offers many options for exhibitors. Many of the displays we offer can be used for all types of events including road presentations and job fairs. The folding panel systems are ideal for sales reps because they are professional and work in nearly any office setting. Table top banner stands can be very useful as an accent to a display or as an informational display. Stretch fabric pop up displays offer a seamless graphic that looks modern and professional. They are much easier to assemble than traditional pop ups making them ideal for travelers. The Showcase display offered many options but has recently been discontinued. Why did we choose this production line? The product line was selected to meet all our clients’ requirements. We only use manufacturers with fast turnaround times and quality products. This insures that any one of our products can make it to the trade show or office in enough time for an event. We have selected products with different designs and sizes because not every event is the same. Table top banner stands are a great asset to a company because they create a professional appearance for any presentation or event. Every product with graphics includes full color digital printing without additional set up charges or fees!